Our kayaks, both those built during courses and those made to order, are all designed based on knowledge of original Arctic types of kayak. The Inuit are a group of people who live, and used to live, across the entire Arctic region. Every little community used to have their own subtype of kayaks, adapted to local weather and sea conditions. This led to a number of different types of kayak, in terms of both appearance and function. Today most types of kayak have disappeared from active use. If you are to build a truly original kayak, you will have to reconstruct some of the knowledge that the Inuit had of design and paddling of kayaks. Kajakkene som bygges på kurs og på bestilling, er alle designet på grunnlag av originale arktiske kajakktyper. When you build a "new" type of kayak, you should first study the available literature, historical photos and drawings as well as measurements of traditional kayaks, and you should visit kayak museums. 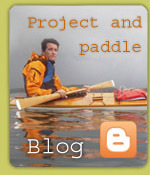 Then you try to get an idea of the form and function of a kayak â€“ these two are closely related. This research may take some time, but at one point you have to get started. Then the construction begins. Kajakkspesialisten builds kayaks from Norwegian wood, both from evergreens and deciduous trees. All wood is judiciously selected to make the kayaks durable and pleasant to look at. Most of the wood is straight and free of knots. 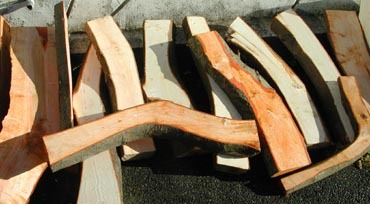 Some wood, which is used for particular curved kayak parts, is specifically selected from trees that have naturally grown crooked - this to ensure that the wood fibres follow the curve of the final part. We start by constructing the wood frame. We bend and twist the wood, steaming some of it to help us bend it into the desired shape. The pieces are connected in traditional fashion with scarf joints, pegs and lashings. This way, the frame becomes very strong, while the kayak stays flexible. This is a major advantage of this type of kayak. The frame is treated with oil and then covered in high-grade canvas. Finally, the canvas is painted with oil that strengthens and waterproofs it. Before the kayak is done, several rounds of sanding and painting are performed to create a smooth and beautiful surface. 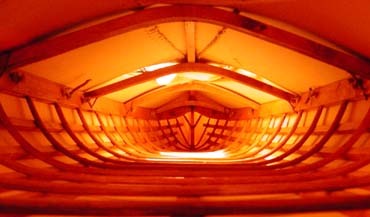 The kayaks are built in as original a manner as possible with regard to construction methods, appearance and form. This is balanced against modern people's needs and use of the kayak. Safety is the highest priority, and the kayaks are designed to meet modern standards for built-in safeguards. As always, safety at sea depends in large part on the paddler's state of mind and experience. With every construction course and kayak sale comes the offer of a kayak safety course. The traditional design and the particular construction methods of our kayaks give them unique abilities compared to plastic or fibreglass kayaks. For example, a skin-and-frame kayak will tackle rough seas well. The flexible construction means that the kayak rides swells very smoothly and flexes with the waves. Many people claim that the flexibility also increases the kayak's speed in rough conditions, but this is difficult to prove. You usually sit fairly low in a skin-and-frame kayak, which gives you more precise control in high winds or swells, which in turn makes the kayak very stable. Here are illustrated descriptions of the models normally sold at Kajakkspesialisten or built at our courses. There are several other models for the specially interested, but the ones described here should cover most of the casual paddler's needs. Choice of kayak is always a compromise between different ideals. You can't get a kayak that's perfect at everything, even though some salesmen might say so. A perfect kayak for rolling will never be perfect kayak for longer trips, and vice versa. You should choose a kayak based on what you're going to use it for, and personal preferences for appearances, as aesthetics are generally important to those who choose original over plastic or fibreglass kayaks. All models shown here can be made with hatches for ease of packing. Such hatches are a modern invention. They usually make kayaks handier for longer trips, where one may desire to bring a good deal of luggage. We make hatches in whatever sizes are desired. They are waterproof and easy to open or close. Our kayaks are also made with steering aids, usually small removable skegs which help the kayak stay on course in difficult conditions. A lot of people ask why I don't use rudders on my kayaks, and the answer is that I find rudders to be unnecessary. Rudders are used to keep modern kayaks on course in high winds, whereas traditional kayaks are designed to stay on course by themselves, thus making the rudder unnecessary as well as vulnerable. The kayaks are available in any color. Most of my own kayaks are made in brown or white colors. There are, however, no limits on how you can color or decorate your own kayak. You can choose bright colors and intricate patterns if your taste goes in that direction. The sea sock is an important security detail. Although the wooden frame will ensure that the kayak floats even when filled with water, it will be difficult to empty the kayak again and paddle it if you are out on deep water. Therefore, skin-on-frame kayaks should have sea socks. A sea sock is a "bag" of waterproof material that's attached to the cockpit coaming and fills the cockpit. It's large enough for you to sit in, and in case you capsize, the sea sock will prevent water from filling up the rest of the kayak. Additionally, it prevents sand and dirt from getting into the kayak, and it insulates against the cold. The special deck rigging also contributes to making the kayak incredibly safe. It's a simple masterstroke which lets you rapidly and easily attach a paddle to the kayak. With a Greenland paddle and a spare paddle, you can add outriggers to the kayak in the space of a few seconds. Leave the paddlefloat at home â€“ you can perfectly well stand up in the kayak when the outriggers are attached! This system is used during capsizes in deep water. With a sea sock and a spare paddle, a decent paddler can empty and re-enter his kayak in less than a minute! The system is foolproof and works under the worst possible conditions. Also see the article about safety and skin on frame kayaks elswhere on this web site. Here are some measures of average kayaks, built here. Remember there is no general rule, your body and/or personal perferences determines the size of your kayak. However these measures are somewhat average for a male adult.